Chestnuts are objects that have been part of my past. I grew up with a huge tree outside my home which every year dropped spiked green bombs from it's branches. When the husks burst open the brown nut inside could be removed or fell out on its own. Some things in nature just feel good in the hand. Chestnuts are small, smooth and cool to the touch. They were perfect for throwing or pipes made by sticking them with Tinker Toy dowels. Later as an adult I rediscovered my interest in chestnuts from an artist's perspective. My son's school was surrounded by horse chestnut trees. The fruit had been dropping on the grounds for years and I was able to view the entire cycle of the plant's life. The ground was littered with broken husks and nuts at various stages of decay. Some were sprouting new shoots and in wooded areas small trees were managing to establish themselves under the shade of their monster parents. 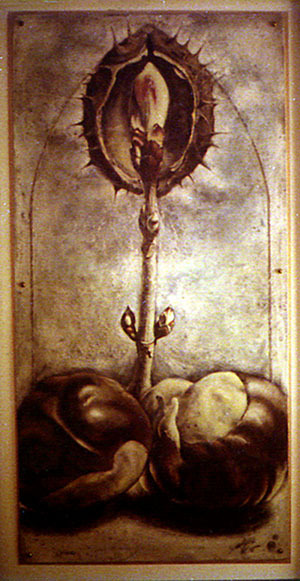 This painting represents that circle of life by depicting different stages of development and adding religious and sexual references in the imagery.